Not much story here, just this picture of my dear man and the other players who have been making music together for about 25 years. They used to be known as NFC Brass but after Mauri’s retirement shifted their association to the town. I put a little bit of filter on the pic just for fun. 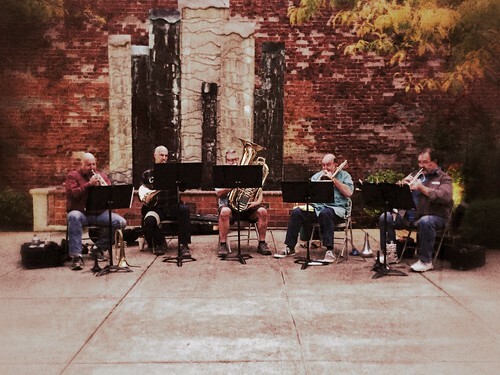 They’re playing in Francis Square downtown Newberg for the First Friday Art Walk. Quite an audience gathered and they played their little hearts out for two hours. I didn’t think I’d stay, but it was such a beautiful evening and there were so many friendly people around (most of the local family) that I stuck around to hear the last note. Maybe next time we’ll get to hear as well! !